Praying for healing, strength and success during the MDM operations. n an emergency or disaster management, most efforts are concentrated on the management of the living victims while less attention is given to the care of the dead and the missing. guaranteeing respect for the dignity of the deceased and their families in accordance with their cultural and religious beliefs. Also, a well-coordinated action in MDM during the ill-fated situation surely strengthened the collaboration among the partner “It was hard during the first days of the agencies and stakeholders that resulted to established operation because relatives of the victims were resource-sharing mechanism among them and key unaware of the process and the protocol of the players -- this is a true display of character as proof of operation and it was hard explaining to them. There the Matino, Mahusay at Maaasahang Gobyerno. #	was an incident where a dead body that did not undergo the process was mistakenly identified by a certain family. They brought back the dead body to the MDM Operations Center and claimed the right one. That's the time the other relatives of the victims came to recognize the importance of the MDM process,” said Victorio Palangdan, Municipal Mayor of Itogon. Such endeavors on emergency and disaster challenged the capability of the government’s existing disaster administration especially the policies and guidelines on the management of the dead and the missing. Little did we know that MDM is one of the most difficult challenges of disaster management. Despite this, the immense impact of teamwork LGOO II Randolph Ligligon hands over recovered and coordination were showcased by volunteers possession of the deceased to his/her next of kin identification of the recovered bodies, issuance of Death Certificates, processing of financial assistance and funeral services up to the transport of remains to be brought to their mourning families. The inauguration of the CLIP Halfway House was graced by Gov. Bonifacio c. Lacwasan, Jr. (3rd from left), LGOO VI Reynaldo Cusi of NBOO (center) and PD Anthony Manolo I. Ballug (5th form left) together with other members of the E-CLIP Committee. n the pursuit of strengthening the organizational knowledge of the institution, knowledge- transfer through sharing of information and updates on the agency's programs, projects and activities (PPAs), is evident during Monday Convocations. With the aim of improving the organization's systems and procedures, the Regional Management conducted a Knowledge Management (KM) Audit and assessment of the Local Government Regional Resource Center – Cordillera Administrative Region's (LGRRCCAR) towards a knowledge-centric organization. The KM Audit and LGRRC Assessment were conducted KM Assessment Criteria Score Rank for three days to respond to the following. Based from the results, LGRRC-CAR is in the expansion stage, which means that there is an Based on the result, LGGRRC-CAR is in the Expansion institutional-wide KM implementation as interpreted stage which means there is an institutional-wide KM in the KM Maturity Level and checklist. Technology implementation as interpreted in the KM Maturity ranked first having the highest maturity level amongst Level and Checklist. Technology ranked first or has the the different criteria with a score of 22.25, while highest maturity level amongst the different criteria KM Leadership ranked least with a score of 16.88. with a score of 22.25, while KM Leadership ranked seventh or last with a score of 16.88. Knowledge Mapping Knowledge Mapping Using this tool, it is evident from the result Using this tool, it is evident from the result that KM in LGRRC-CAR is practiced since most body/sources of knowledge are explicit, therefore, are regularly shared amongst or within the organization and other stakeholders. Furthermore, KM is updated and reusable. In preparation for the formulation of the PGRR map, the province conducted a Provincial Assessment-Workshop on LRM and PFM. The activity served as an avenue to accomplish the objectives of the Conditional Matching Grant to Provinces (CMGP) Program, a program of the government which aims to address the destitute state of provincial roads across the country, as well as to instill government reforms to improve the competency of provinces. that in LGRRC-CAR is practiced since equivalent most body/to thereKMare only 71 actual connections sources knowledge are therefore, are 64.55%. of Meanwhile, 25 of theexplicit, 110 possible connections regularly shared amongst/within the organization and are reciprocated which is equivalent to 35.21%, with otherthat stakeholders. Also, KM is updated andsources is remeaning these agencies/offices are both usable. and recipients of knowledge . Social Network Analysis Knowledge The Social Network Analysis of LGRRC-CAR Capital Planning shows that the LGRRC has one hundred ten (110) possible connections. However, there are only seventy	In filling out this tool, responses made by one (71) actual connections. Twenty-five (25) of Form the the LGRRC-CAR core team are indicated using 110 possible connections are reciprocated, which No. 3 in assessing LGRRC capacities in implementing means these agencies/offices both sourcesitand programs and projects. Afterareconsolidation, was recipients of knowledge. evident that there are knowledge gaps to be acted upon in the In terms of percentage, LGRRC-CAR is different Capacity Pillars,thenamely: Structure, connected to 64.55% of its network of stakeholders Competence, Enabling Policies, Management Systems, and 35.21% & is Learning reciprocated. Knowledge and Leadership. Knowledge Capital Planning In filling out this tool, responses made by the Conclusion LGRRC-CAR core team are indicated using Form 3. Assessing LGRRC Capacities in Implementing Using the tools provided the Local Programs and Projects as basis. After by consolidation, Government Academy, numerous gaps and weaknesses it was evident that there are knowledge gaps to be wereupon identified needs to be addressed order to acted in thethat different Capacity Pillars,innamely: improve the organization's Knowledge Management Structure; Competency; Enabling Policies; Management as well as its operations and functionality. Meanwhile, Systems; Knowledge & Learning; and, Leadership. the identified strengths of the LGRRC-CAR needs to be sustained and the opportunities to be harnessed. With the results of the assessment and audit, these were used as basis in solution-finding and action planning to ensure that the LGRRC-CAR will improve its operations and functionality that would result to better service delivery for its stakeholders and contribute to the excellence of local governance by fostering a culture of learning. # Completion of the Provincial Governance Reform Roadmap (PGRR) During the activity, the participants were able to apply the recommendations and suggestions given by the UNDP consultant Ms. Marjorie M. Balay-as, who critiqued the output of the participants. The workshop ended with a meeting convened by the members of the Local Road Management Team (LRMT), who discussed on further measures to be undertaken in strengthening the strategies for PGRR. Furthermore, DILG -Ifugao conducted activities for the formulation of the Provincial Results Matrices. he Department of the Interior and Local Government - Apayao conducted the Barangay Rollout Training on the Enhanced Module on the Prevention of Violent Extremism on November 27-28, 2018 at the Municipal Conference Hall, participated by the Apayao Police Provincial Office, Philippine Army, National Intelligence Coordinating Agency and interfaith groups. The activity aimed to boost the engagement and support of the local communities to counter violent extremism and promote partnership among barangay officials, civil society groups and members of the community, since the barangay is recognized in development building by promoting and establishing peace and order within the community. The DILG-Mt. Province and MLGOO Lourdes Claire F. Peel were declared nominees during the 3rd Capacity Development Awards for Catalysts of Excellence (CapDev ACE) Gabi ng Parangal, held at the Manila Hotel on December 13, 2018. The Provincial Office was ranked sixth (team category) among the 13 nominees for the Bugkos ng Bayan Award. It was recognized for its initiative entitled, "Enhanced Project SWEEP: Sustainable Work through Effective and Efficient Performance," which fast tracks implementation of DILG PPAs by intensifying its communication and information strategies, records system, stakeholder partnerships and strengthening of the organizati on. On the other hand, MLGOO Peel is a finalist among the 11 nominees under the Singsing ng Tanikala Award because of her significant contribution in strengthening various local councils and was able to institutionalize the Indigenous Peoples' representation in the municipal and barangay levels. ith the theme “Empowering DILG-Abra Team towards a Child-Friendly and GenderResponsive Locally Funded Projects” DILG Abra, headed by PD Millicent B. Cariño, conducted the Child-Friendly Local Governance Audit (CFLGA) retooling, assessment of Gender-Responsive Locally Funded Projects (LFPs) and conduct of team building on October 8-9, 2018 at the Kahuna Beach Resort, San Juan, La Union. GAD specialists Ms. Maria Merla Aquino and Ms. Rosalinda Lacsamana were resource speakers during the two-day activity, which aimed to improve teamwork, increase productivity and nurture innovation. The activity provided lectures on CFLGA and Gender Responsive LFPs where the fundamentals, legal basis, guidelines of implementation, rights of children, and the status of children’s welfare in the Philippines were discussed. Such activity indeed empowered the staff and most importantly valued that Together Everyone Achieves More (TEAM). Have fun! Feel good! For D-I-L-G! One team! One goal! For D-I-L-G Benguet!” was the roaring cheer of DILG - Benguet personnel during their team building activities at Lola Corazon Leisure Farm, Candaba, Pampanga on December 17, 2018, where they engaged in various stress relieving activities, to put their skills, agility and stamina to the test. Most Outstanding MLGOO. Top performer in the Provincial Office Finance and Administrative Section (FAS) and Capacity Development Section (CDS). (Tuba) Outstanding Sangguniang Bayan in the 1st - 3rd class category. 1st Runner – Up Outstanding MLGOO Top performer in the Monitoring and Evaluation Section (LGMES). (Sablan) Outstanding Sanggunian in the 4th – 6th class category. 1st Runner – Up for the Lupong Tagapamayapa Incentives Award (LTIA) in the the 4th – 6th class category. 2nd Runner – Up Outstanding MLGOO. (Mankayan) 1st Runner – Up in Barangay with Best Peace and Order Council (BPOC) in the 1st –3rd class category. 2nd Runner – Up Outstanding MLGOO. (Mankayan) 1st Runner – Up in Barangay with Best Peace and Order Council (BPOC) in the 1st – 3rd class category. (Bakun) Accomplishing all six (6) 2018 AM projects as early as November. First to complete the conduct of Barangay Agenda for Governance & Development (Barangay – AGAD). First to submit her annual accomplishment report. (Buguias) Highest rating for 2017 Anti – Drug Abuse Council performance audit. (Kibungan) Highest rating for the 2018 Child Friendly Local Governance Audit (CFLGA). (La Trinidad) Most Outstanding in LTIA 1st – 3rd class category. Most Outstanding in BPOC 1st – 3rd class category. Highest rating for 2017 Peace and Order Council Performance Audit. DILG-CAR Regional Director Marlo L. Iringan presenting the overview of the actvity. 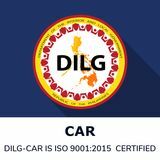 Baguio City -- DILG – CAR headed by Regional Director Marlo L. Iringan, conducted a Summit on Good Governance on November 29, 2018 at the University of Baguio Gymnasium attended by 1,328 participants composed of elected Punong Barangays and Sanguniang Barangay members of the Cordillera and other distinguished guests. Ricojudge Janvier Echiverri and Roosque B. Calacat and USec for Barangay Affairs Martin B. Diño. Lectures presented were on the barangay's role against corruption, prevention of illegal drugs and campaign against criminality. The event aims to enhance the participant's capacities, performance, and enable them to effectively and efficiently deliver services to their constituents and become active partners in the implementation of the government's PPAs. (Top L-R) ASec Ricojudge Janvier Echiverri, ASec Roosque B. Calacat , ASec Manuel B. Felix, and USec Martin B. Diño. Any person holding a public appointive office or position including active members of the Armed Forces of the Philippines, and other officers and employees in government-owned or controlled corporations, shall be considered ipso facto resigned from his office upon the filing of his certificate of candidacy. Since COS/JOs are not appointive officials, this level is of the considered view that the above-mentioned provision of the COMELEC Resolution is not applicable to them. Thus, they are still entitled to their salaries for services rendered after filing of their Certificate of Candidacy (COC). Section 8, Article IX(B) of the Philippine Constitution â&#x20AC;&#x153;No elective or appointive officer or employee shall receive additional, double or indirect compensation, unless specifically authorized by law, nor accept without the consent of the Congress, any present, emolument, office, or title of any kind from any foreign government. Although services rendered under Job Order contracts are not counted as government services as there is no employer-employee relationship created between the government and the job order employee, still, it is considered â&#x20AC;&#x153;working" in the government. Hence, to allow the job orders and contracts of services as exemption would be to indirectly permit an act that is directly prohibited by the Constitution on double compensation. It would be an interpretation that collides with the spirit and the intention of the prohibition. > Lastly, the compensation received out of the contract is sourced from government funds, thus, technically, receiving double compensation from the government which is proscribed. Changes through Excellent and Sustainable Strategies. Have the digital copies straight from your smartphone, tablet or laptop! Like us on Facebook to get the latest news and updates! Download the issuu mobile app for iOS or Android to get the latest Gongs and Drums issues. 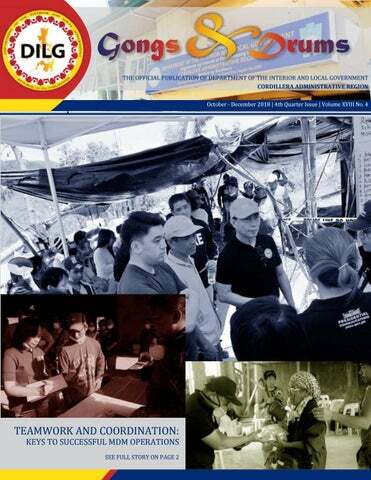 Gongs & Drums is published quarterly by Department of the Interior and Local Government - Cordillera Administrative Region Regional Office.